Building on the success of last year's award‐winning HUAWEI Ascend P7, the new HUAWEI P8 is the culmination of the P series' rich heritage of style and functionality, and is once again redefining the smartphone market with easy-to-use features that amaze and inspire consumers. EISA praised HUAWEI for delivering "improved camera performance and surprisingly high‐end craftsmanship that gives this affordable device a truly sophisticated appearance." It highlighted its 2,680 mAh capacity battery, f/2 lens developed for better low‐light performance and the HUAWEI P8’s excellent 5.2‐inch Full HD IPS‐NEO display. The low-light camera performance allows consumers to be more creative using the best light painting facility available on a smartphone and amazing crisp high contrast shots. The HUAWEI P8 also features a compact and powerful dual-antenna design plus rapid switching technology allows the phone to intelligently recognize the best mode reduces dropped calls and maintains a stronger signal. "We are proud to be presented with this award for the third year in a row. We are committed to challenging the industry and revolutionizing how a smart phone is used - the HUAWEI P8 is the most user-friendly smartphone for consumers globally," said Glory Zhang, Chief Marketing Officer, Consumer Business Group (BG). In August 2014, HUAWEI Ascend P7 was named 'European Consumer Smartphone 2014 - 2015' and was praised for its 'beautiful glass finish', 'attractive price' and its 8-million-pixel front-facing camera and rear 13-million-pixel sensor with flash and supporting apps. HUAWEI Ascend P7 is now on sale in over 100 countries and has shipped more than 7 million units since it was launched. 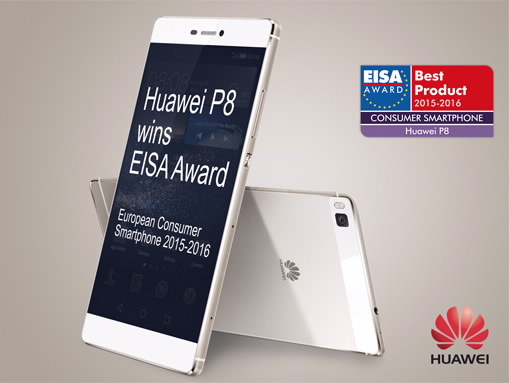 In 2013, HUAWEI had been awarded the 'European Consumer Smartphone 2013 - 2014' for the ultra slim 6.18mm Ascend P6.